Up at 7 a.m. I drop off Frank at Erringer and Los Angeles Streets where the parade will begin at 9 a.m. He will walk along with our square dancer friends. They will dance. He will hand out flyers inviting people to join us square dancing on Monday nights. I drive down to Sinaloa Street where the judging stand and announcer is, near the end of the parade, and find a nice shady spot for my chair next to the curb. Gary, Maria and the boys join me. It's 10 a.m. before the parade reaches us. It's 11:00 before Frank comes by. It's a fine home town type parade. Afterward we all go to the park and eat lunch. In the evening we go to Verna and Bob's for a potluck and 24 of us play Hand and Foot (card game) at 6 tables until 10:30. It's great fun. Wow, a 3 exclamation point day! Don't see too many of those. Mom loved a parade. And she still had the energy to go to a party until 10:30 at night afterward. 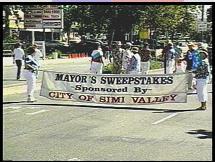 I searched the web for information on their square dancing club and found the video above was taken at the Simi Valley Parade in 2006. The Boots and Slippers Square Dance Club has been around since 1959. I am contacting their president to see if any of the current members were there in 1992 and to let him know how much I appreciate their members who were so helpful to Mom and gave her such joy those last few years. It was the members of this club who stepped up and prepared all the food for the reception after Mom's funeral.